Connect your media files to your PlayStation 3. Is there a better alternative to MediaLink? Is MediaLink really the best app in Video category? Will MediaLink work good on macOS 10.13.4? MediaLink, with its flawless iTunes integration, makes getting to your songs on your PlayStation 3 just as easy as it is on your Mac. Find any song, album, or artist with ease in the Mac-like navigation system provided by MediaLink. It also conveniently shares your playlists, podcasts, and videos to your PlayStation 3. With MediaLink, you can view your iPhoto or Aperture photo library and slideshows on your television screen; they're especially beautiful in vivid high definition. Browse by photo album or event, or watch a slideshow to the tune of your favorite song. It's all easy and fun! Want some motion? Watch your iPhoto videos too! Make your PlayStation 3 your home media center. MediaLink can stream high-definition video content to your living room with ease! Continue movies from where you left off or fast forward and rewind, all effortlessly using your PlayStation 3 and MediaLink. Don't use iTunes or iPhoto? Do you have media stored outside your libraries? No problem! MediaLink has full folder organization support. 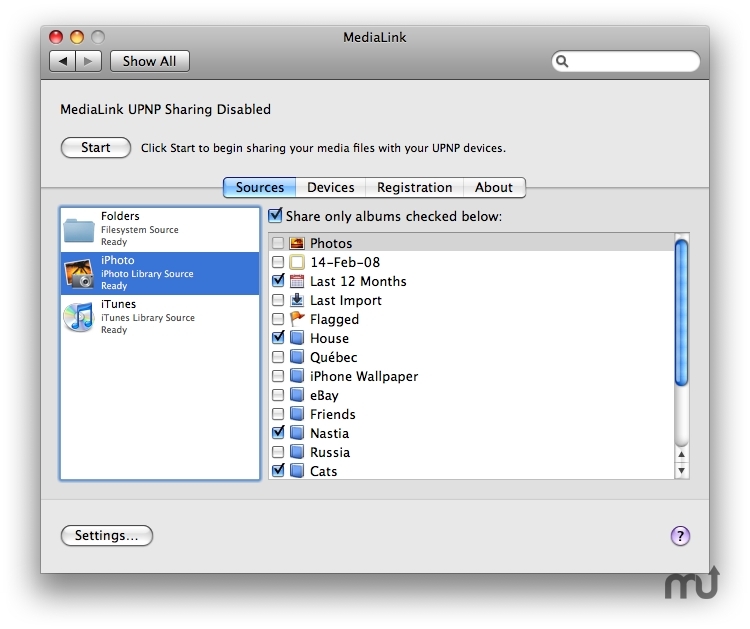 MediaLink can easily locate music, photos, and videos in any folder on your Mac and even preview it and collect ID3 information from your songs.